The Montana Legislature has gone all in on big government and socialism with HJR 28. American Prairie Reserve has legally acquired federal grazing leases. The Montana Legislature is proposing to instruct the BLM to use “science to dictate “ grazing practices on lands owned by the U.S. government and managed by Montana ranchers and the American Prairie Reserve. American Prairie Reserve and BLM have used science to study the grazing. The intent is to keep native bison off of native pasture in Montana. Republicans in the Montana Legislature have used no science or common sense in drafting HJR 28. I know a little about Montana ranchers, north-central Montana and science. All four of my grandparents were homesteaders/ranchers in north-central Montana and are buried there; my parents were Montana ranchers and are buried in north-central Montana. I am a Montana rancher. I also wrote my master’s thesis in soil science at Montana State University about the Scobey soil series, which is a common soil type on the American Prairie Reserve. First the business. The APR is proposing to raise bison on land owned by the federal government and leased for grazing. Many ranches in north-central Montana own ranches that are adjacent to lands owned by the U.S. government. The APR has purchased a few of these mixed ownership ranches. The government leases these lands to these ranchers and charges about 10 percent of the amount charged to lease similar state of Montana lands in the area. The private lease rate charged between ranchers in the area is about 15 times the rate paid to taxpayers on federal land. Yes, this is a large federal subsidy for private business. The ranchers must follow basic good grazing management practices in order to maintain the subsidy. This is a federally subsidized program like Medicare, Medicaid and food stamps. Some of these lands raise cattle, some sheep and some horses. The APR has proposed to raise bison on the same land, but decrease the amount of grass consumed by up to 75 percent. The additional grass available will be a boon to the native wildlife that also occupies these lands. Now the science. The Scobey soil and related soils is a very productive soil for both native grassland and wheat. When farmed incorrectly or overgrazed it is susceptible to wind erosion. The APR will decrease the grass harvested by animals annually by more than 50 percent. My ancestors and myself have been successful ranching in Montana by following the simple rule of “take half, leave half” of the grass grown annually. This allows native species to compete with in invaders (weeds) and prepares the ranch for the coming droughts that will occur in Montana. Bison have grazing habits that are different from cattle that are also different than sheep and horses. We can debate each species grazing habits and suitability for Montana rangeland, but no Scientist would rate bison as tougher on the land than the other species. The Montana Legislature should not open this can of worms with the Congress. Most members of Congress don’t know that there is a huge subsidy that has been offered to Montana ranchers. When they read HJR 28, they may instruct their staff to study the issue. Imagine the dismay that conservative Republicans will feel when they learn that the U.S. government has another government subsidy that picks winners and losers (those who have leases and those who don’t). They will wonder how this is fair to the thousands of cattleman around the country who pay 10-20 times as much to raise beef and somehow compete. They will wonder how this is free market. Liberal Democrats will rub this in the face of conservative Republicans from Western states whenever subsidies for healthcare, education or food stamps are debated. This socialist philosophy of picking winners (cattle) and losers (bison) is silly. What happened to freedom? What next? Ban Charlois and Limousine breeds because they have French names? Ban Corrientes Cattle because they are Mexican? Only allow whiteface Sheep? Only allow Border Collie cow dogs (my favorite)? The APR will attract thousands of tourists to Montana to see native animals including Bison on Montana native rangeland. Tourism has attracted more than 12 million people to Montana each year. Residents of north-central Montana have often complained that they don’t share the wealth of tourism with Western Montana counties. Here is a chance to put your mark on Montana tourism. A buck spent to see a bear is worth no more than a buck spent to see a Bison. The APR bison plan is good for the land, good for the community and great for Montana. The Montana Legislature should stand with science and freedom and against big government central planning socialism by rejecting HJR28. 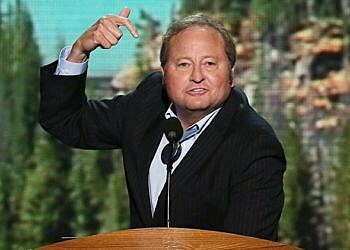 Brian Schweitzer is the former governor of Montana.